This was a really epic edition of Thursday Tea as we marked the Great Get Together in memory of Jo Cox, the MP murdered by a racist in June 2016. The church buzzed with activity as we welcomed our special guests for the evening, the Deputy Mayor of Croydon Councillor Humayun Kabir and his wife, along with the boys and girls of New Valley School Choir and their teachers. The food was just amazing. A huge thank you to all you great people cooked and brought dishes to reflect where you come from. It was truly magnificent! 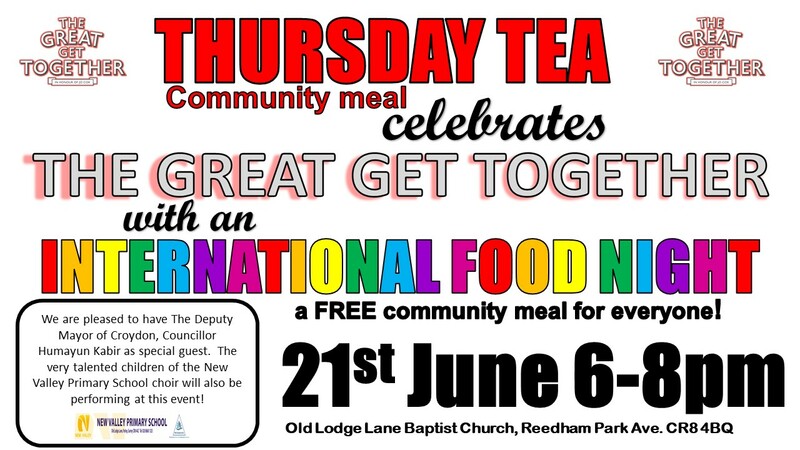 We were also overwhelmed by the generosity of local businesses like Costco, Rice-N-Spice, Danny’s Chip Shop, Pizza Express, Domino’s, Urban Fuse Café & Wine Bar, Planet Pizza and Purley Tesco who all donated to Thursday Tea International Food Night 2018. Thank you to everyone who came, and thank you one and all for your fantastic support.